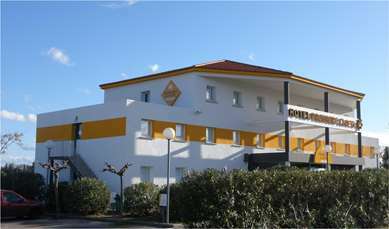 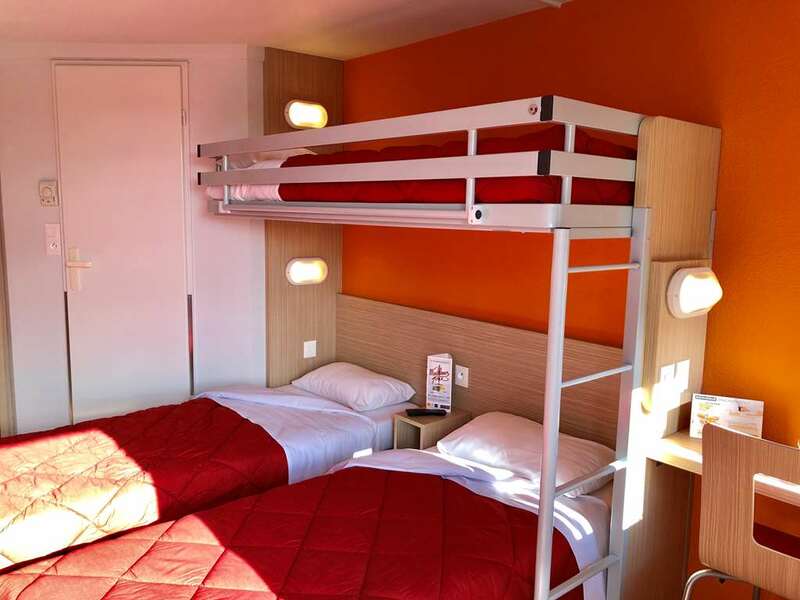 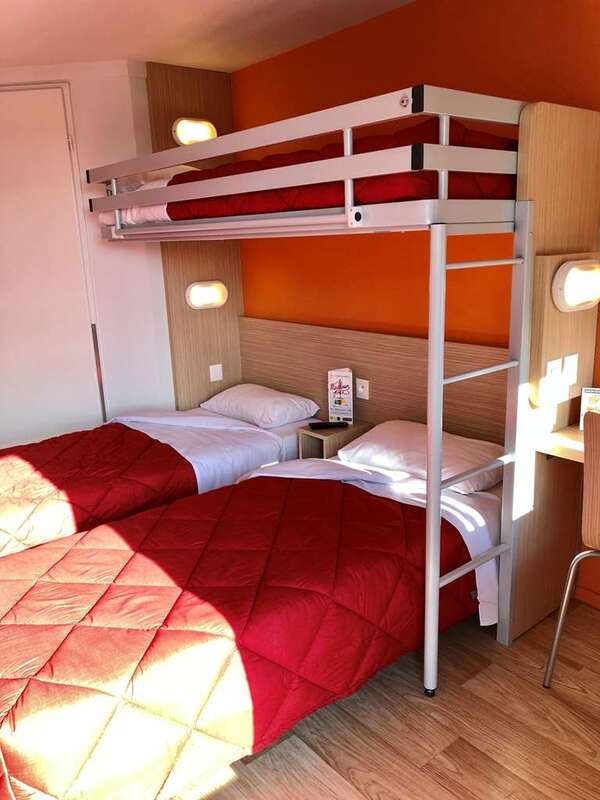 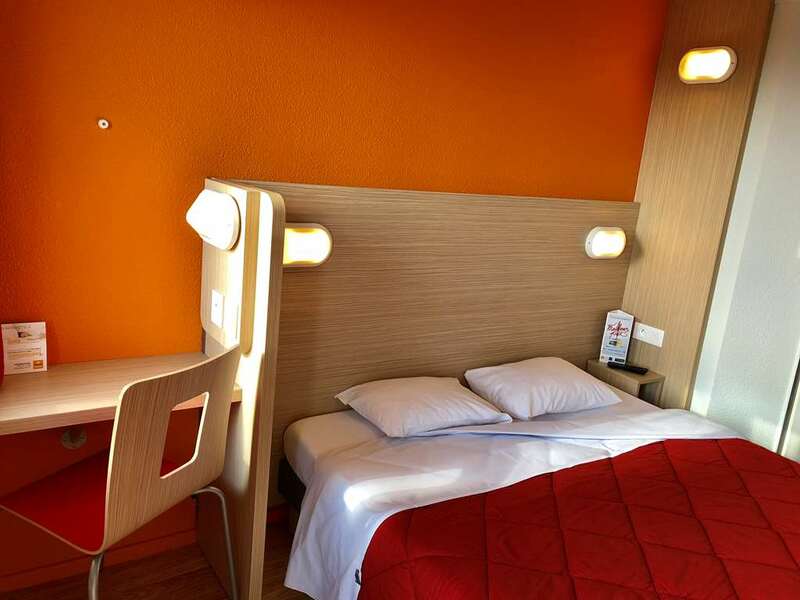 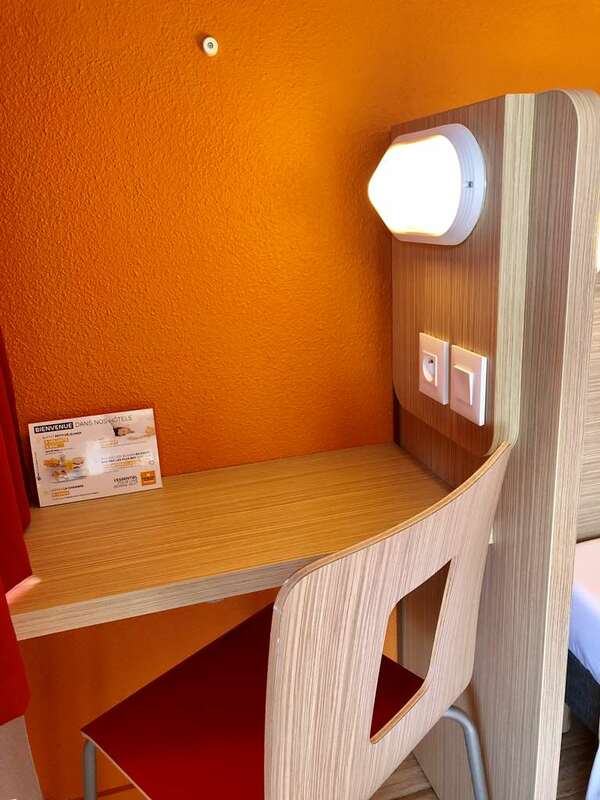 Reserve an affordable hotel room at Hotel Première Classe Perpignan Sud between the Pyrenees and the Mediterranean. 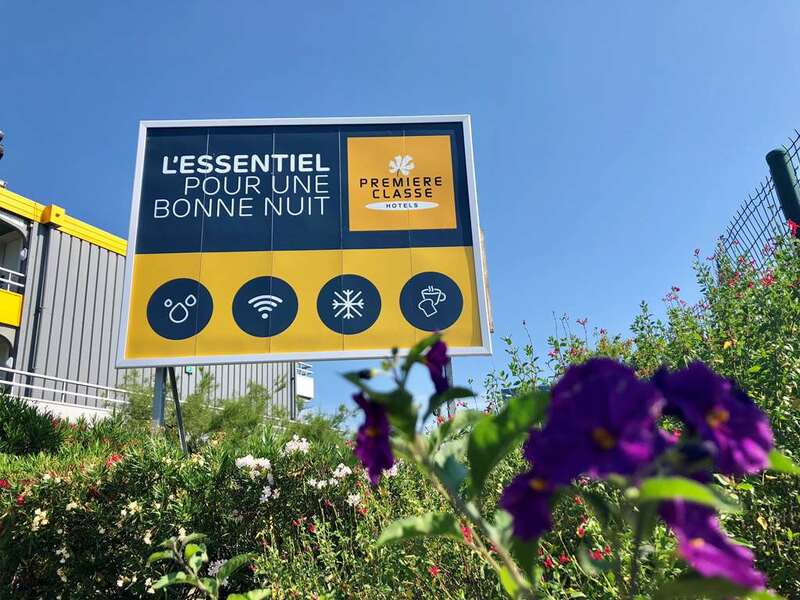 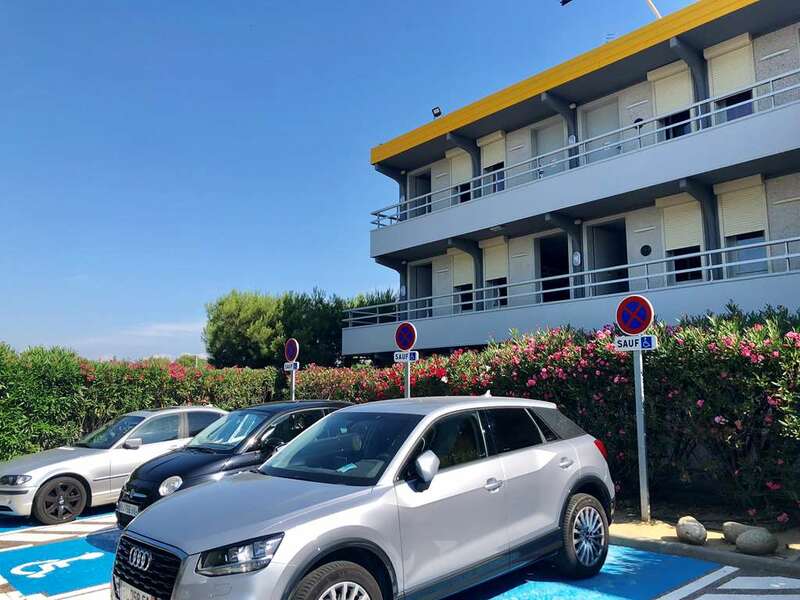 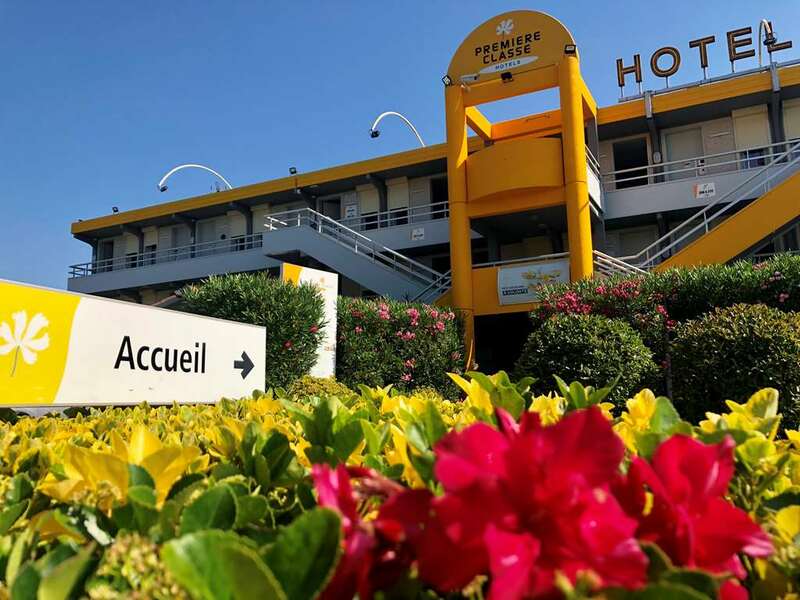 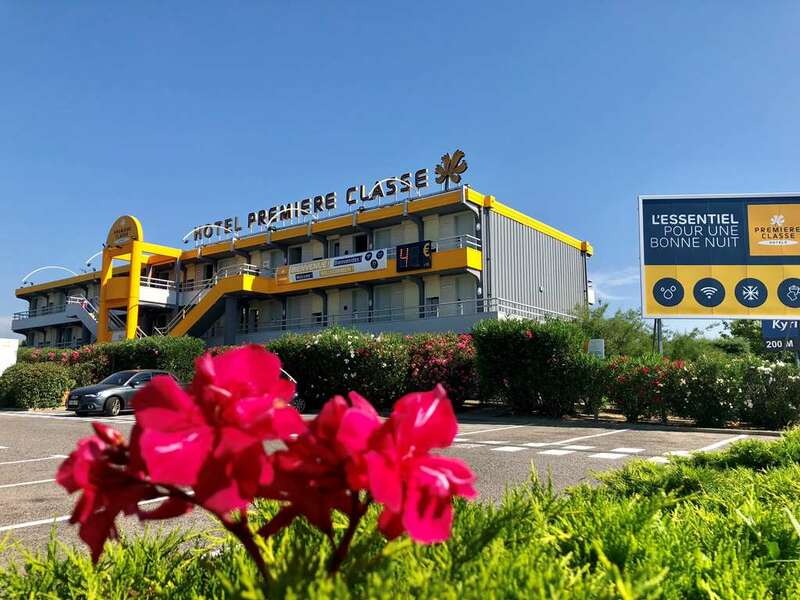 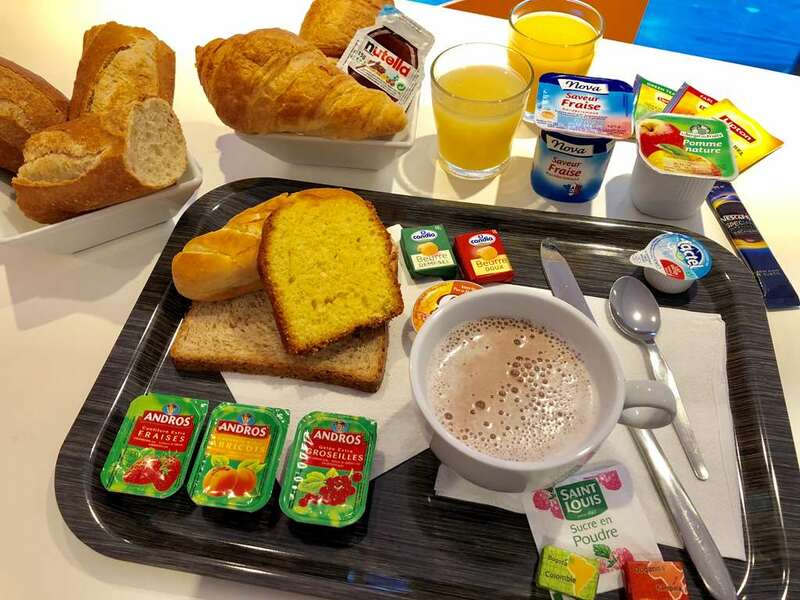 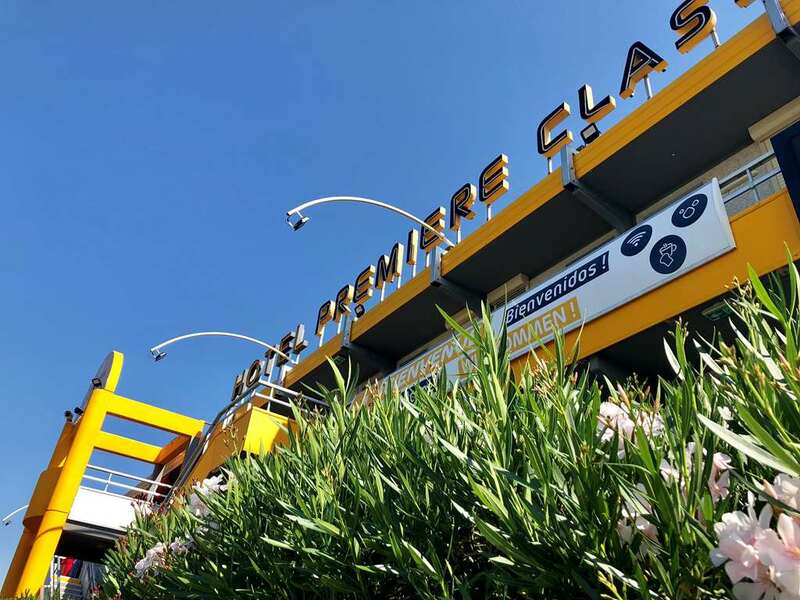 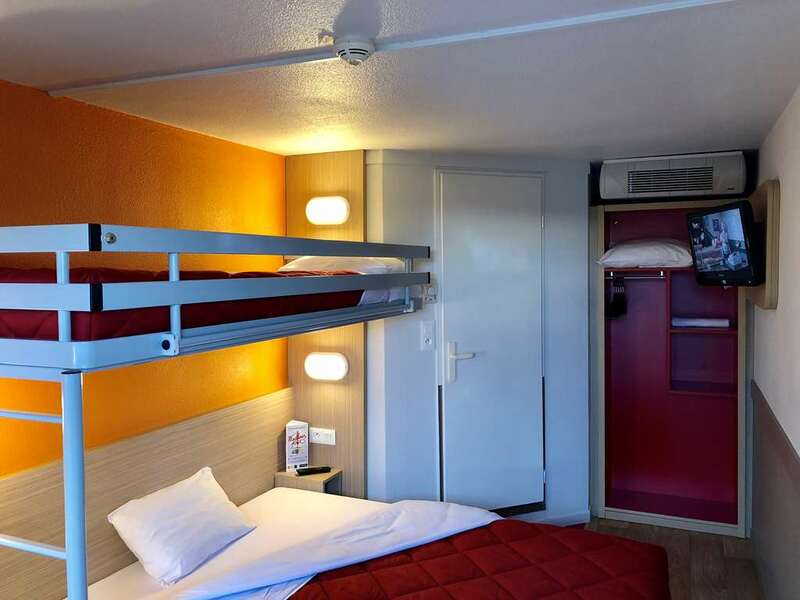 Welcome to Hotel Première Classe Perpignan Sud, your last stop before Spain and Le Perthus located about a mile and a half from highway A9 (exit 42). 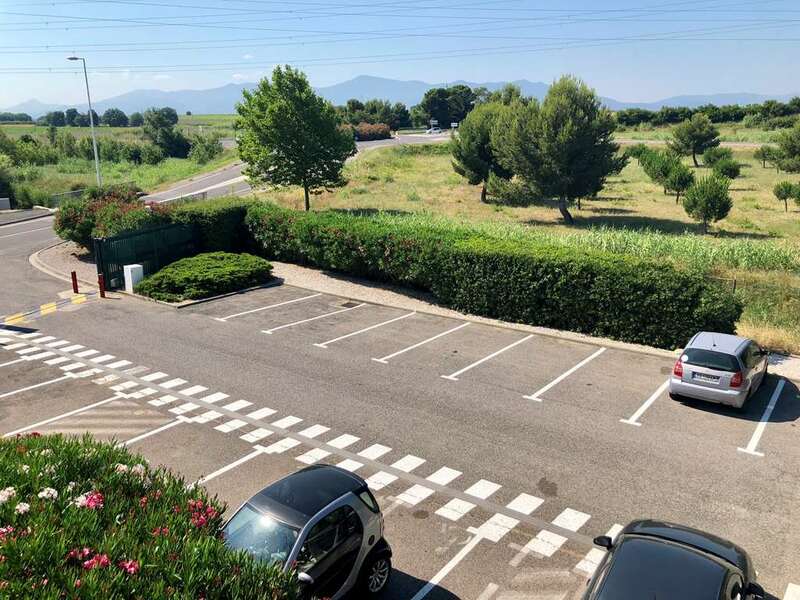 At the foot of the Canigou and near the most beautiful beaches of the Eastern Pyreness, our hotel is easily accessible from the highway (toward Barcelone-Gérone) from the city center, the Convention Center or the Perpignan SNCF train station (about a mile and a half away). 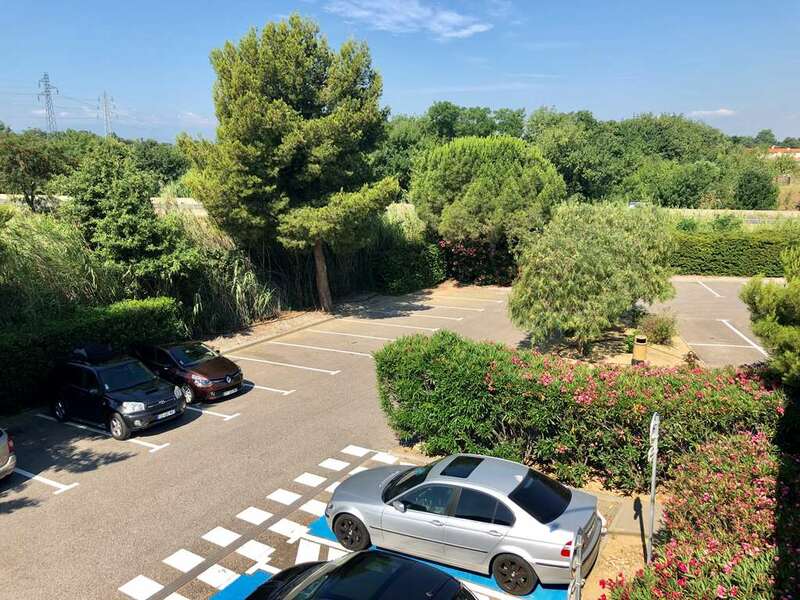 In just 20 minutes by car, you can get to the main beaches of Argelès-sur-Mer, Saint-Cyprien and Canet. 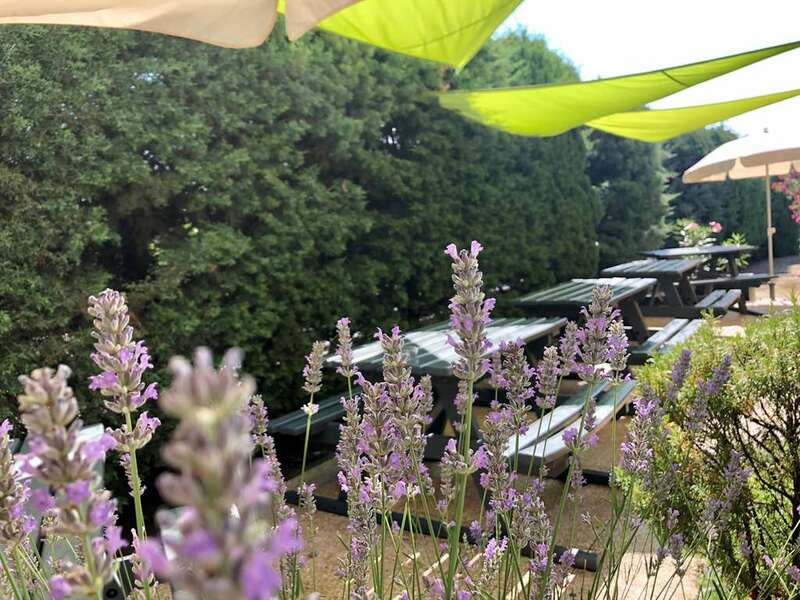 Come discover the traditions, specialties and wines of Catalan country. 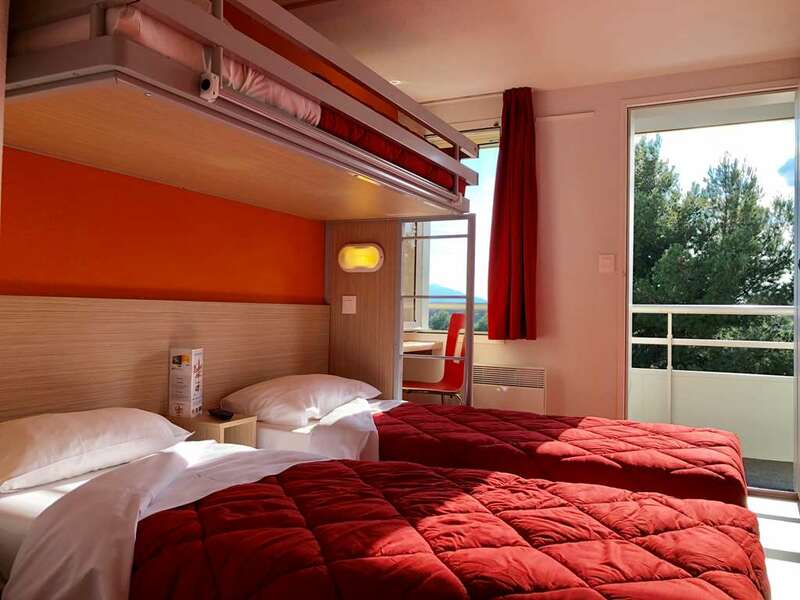 Come explore the back country and the marvels of the Pyrenees mountains, such as Canigou, Les Albères, Les Aspres or Les Fenouillères. 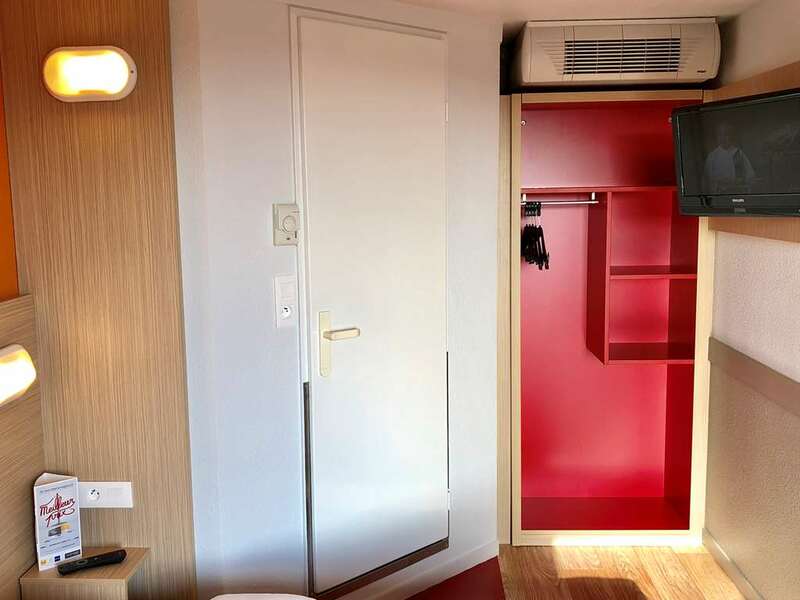 Our 71 entirely air conditioned rooms are all equipped with private shower cubicles so you can spend a comfortable stay in Catalan country. 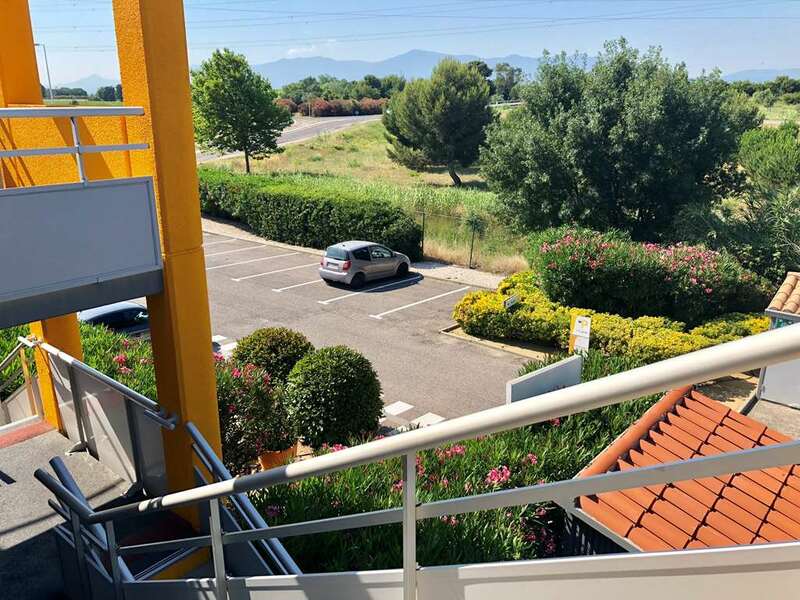 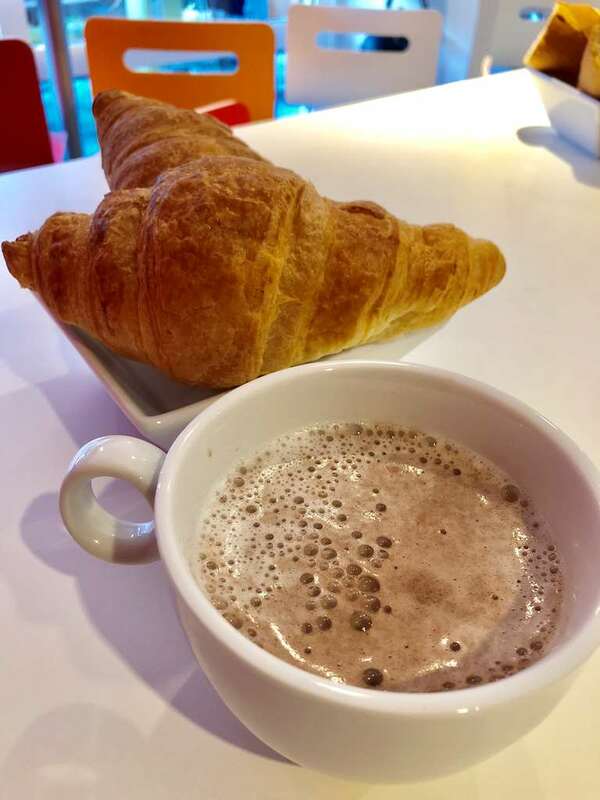 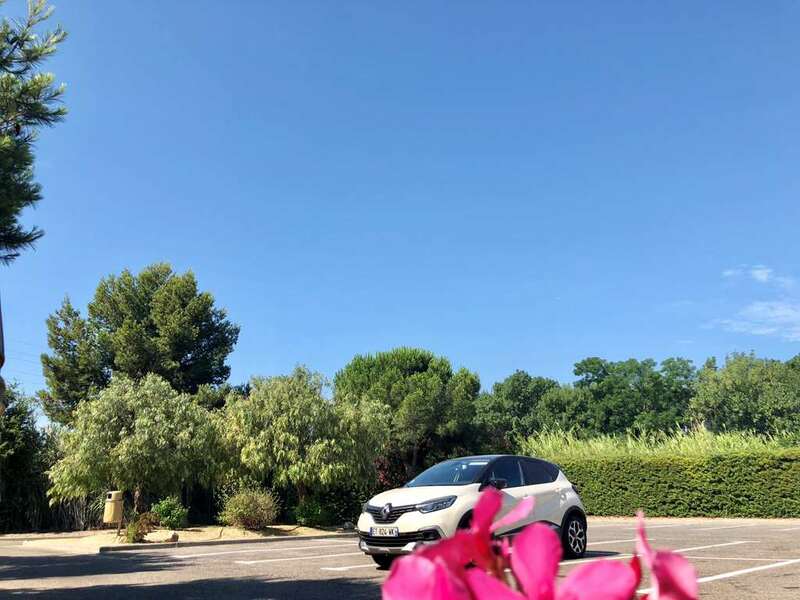 You can go have lunch or dinner at the Campanile Restaurant in Perpignan Sud that's just a 5 minute walk away, while leaving your vehicle in the enclosed hotel parking lot at no charge. 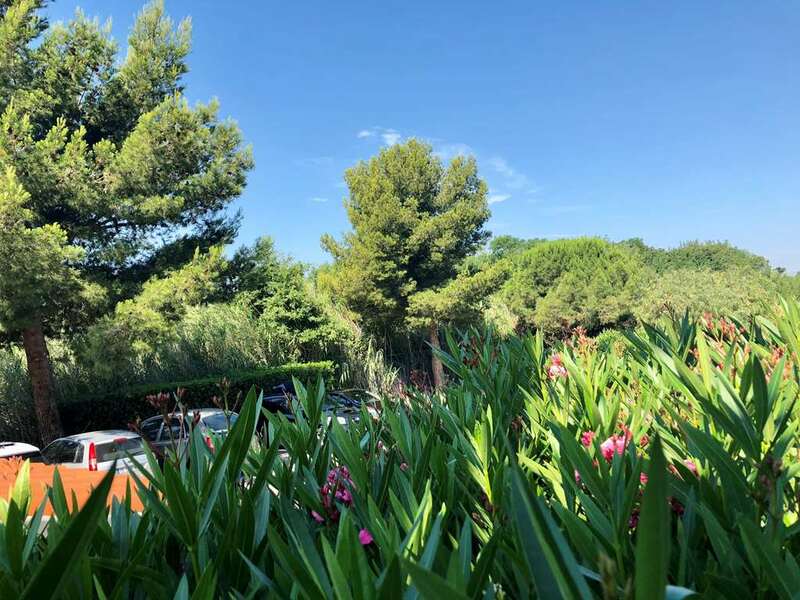 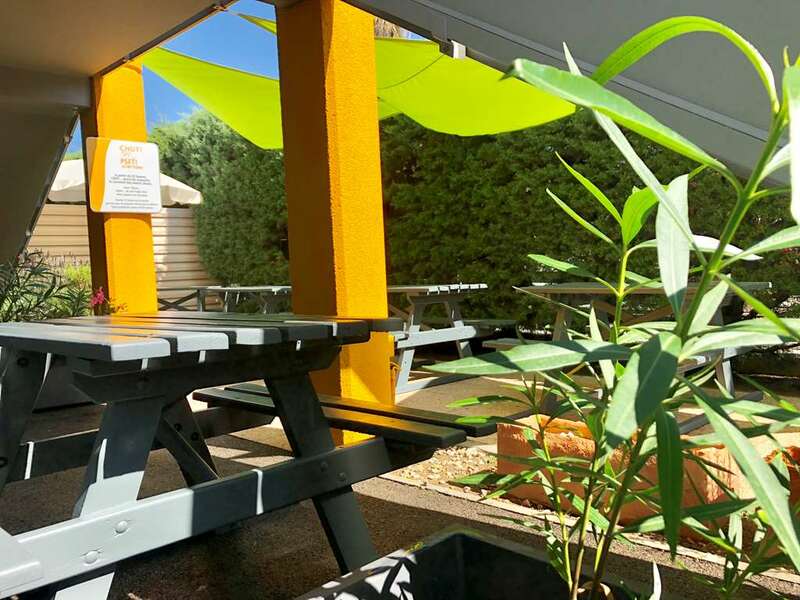 The shady terrace of our hotel welcomes you each morning during your stay, where you can have a delicious breakfast in a charming atmosphere about a mile from Villeneuve-de-la-Raho Lake. 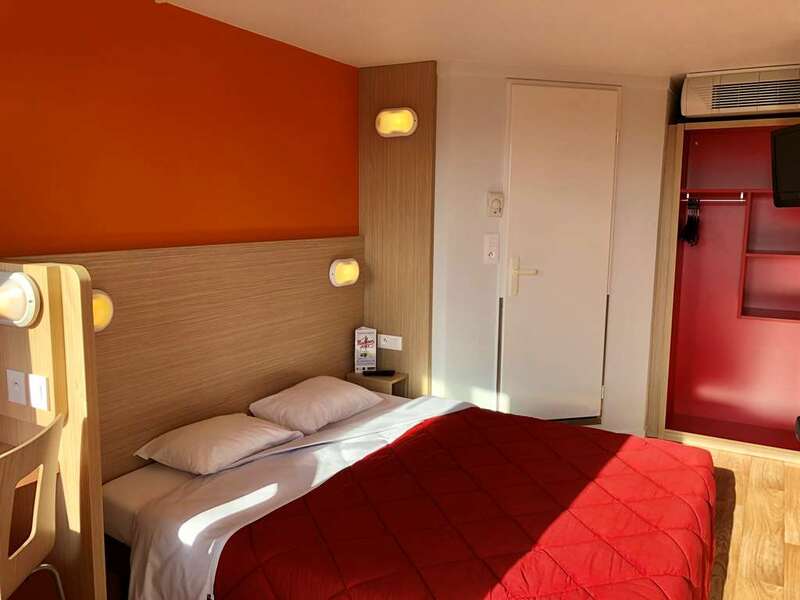 In all our rooms, you will have a shower cubicle with private toilet and sink, a flat-screen TV with TNT, the comfort of adjustable air conditioning, as well as free Wi-Fi. 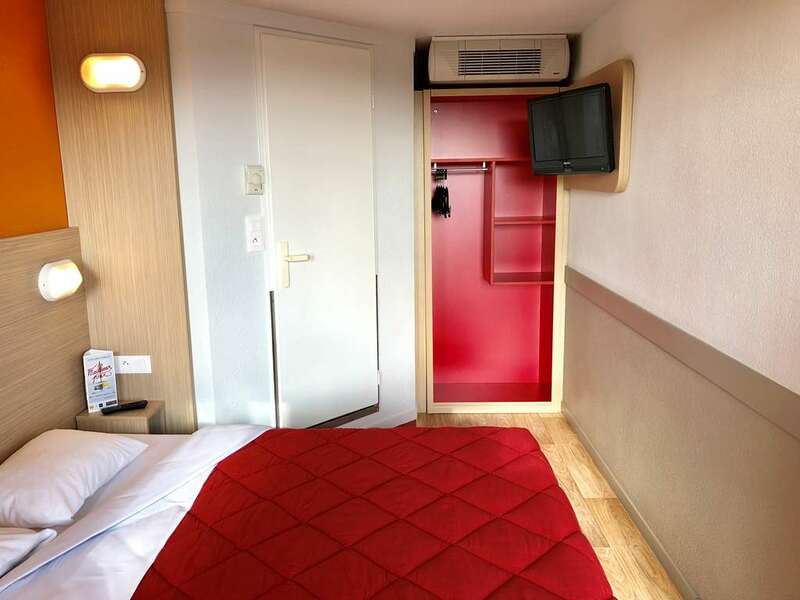 Our 1 air conditioned rooms are about 123 sq. 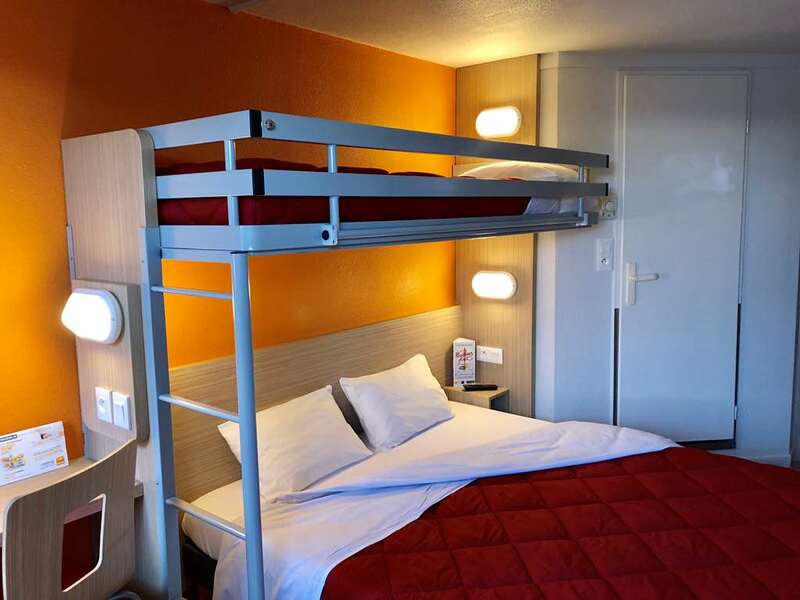 ft. and can welcome up to 3 people. 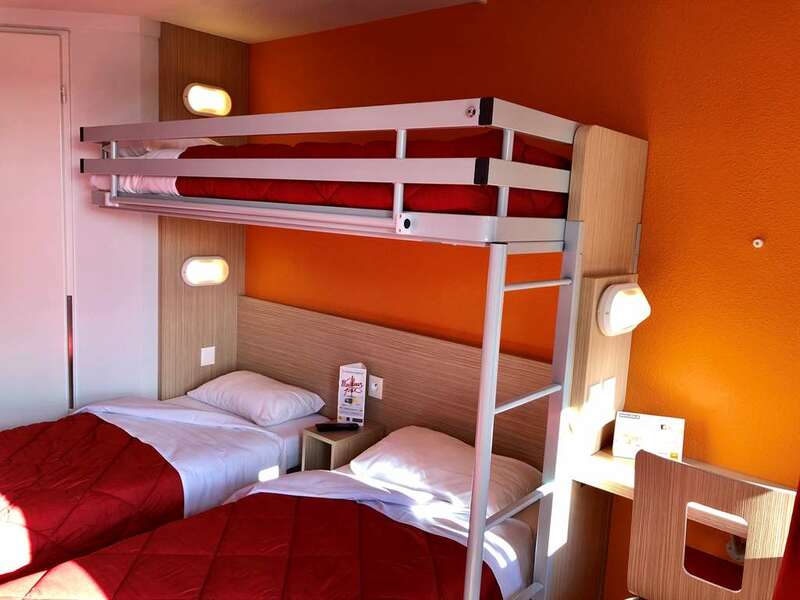 Most rooms have a bed with box spring for 2 people and an overhead bunk. 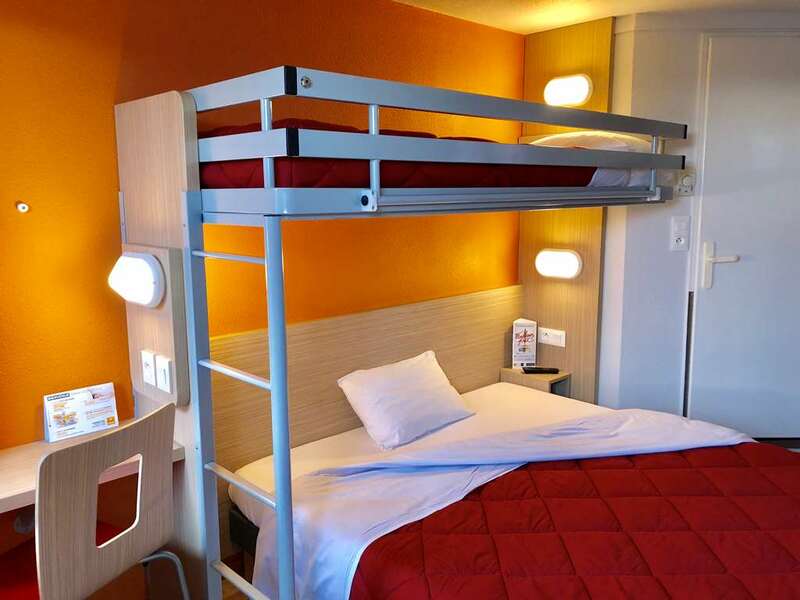 We also have rooms with separate beds. 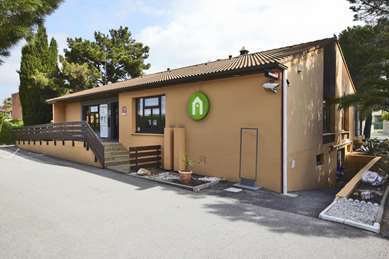 Our hotel is specially adapted and regularly inspected to be accessible to people with reduced mobility, and we also have specially adapted rooms.